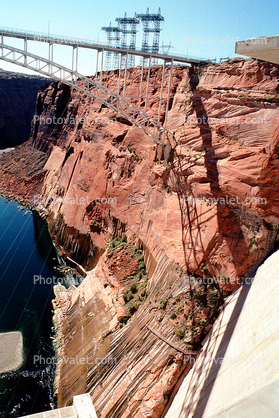 This steel arch bridge spans 475.5 meters (1,560 feet) and rises 213 mters (700 feet) above the Colorado River. It is the 4th highest bridge in the USA. Behind this Glen Canyon dam is the artificial lake it created Lake Powell. This project has inundated a huge swath of spectacular Arizona nature including Glen Canyon. US Highway 89 is carried at the top of the dam.